Professor Amir Amedi​ is a leading neuroscientist ​ working ​on unraveling ​the ​complex balance between ​stability and flexibility ​in the organization of​ our sense ​for over 15 years. His main research interest involves our senses. He is an expert on Brain imaging of the senses, Restoration and Rehab of the senses and finally the Augmentation of Senses and developing super human sensory abilities. His research focuses on sensory integration, brain plasticity and sensory restoration. His work has helped to unravel crucial principles regarding brain (re)-organization (e.g. the role of unisensory experience in critical periods) as well as ​to create guidelines for rehabilitation and has now matured into a full-blown theory of the human brain specialization principles. 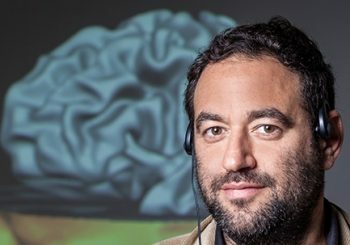 He ​took his PhD in​ Computational Neuroscience from the Hebrew University ​and ​continued to a postdoctoral fellowship at Harvard Medical School before returning to the Hebrew University in 2007. Amir is now an Associate Professor for Medical Neurobiology and Cognition at the Hebrew University and a member ELSC. He is also an Adjoint research Professor in the Sorbonne Universités and in the Vision Institute, Paris France​. ​ In his spare time Amir enjoys listening to music, playing Jazz on his Tenor saxophone, reading, diving and hiking. In 2017 Amir co-founded together with Tomer Behor the ReNewSenses start up aimed at Rehab and Augmentation of the Senses. ​During his career, Amir won many prestigious prizes and funding among them The Krill Prize for Excellence in Scientific Research, the Wolf Foundation (2011); The James S. McDonnell Foundation Award in Understanding Human Cognition (2011); An ERC grant from the European Union (2013) and The faculty of Medicine prize in pre-medical teaching (2016-2017).